We expected to see outstanding performance from the P5 Pro and it definitely did not disappoint. 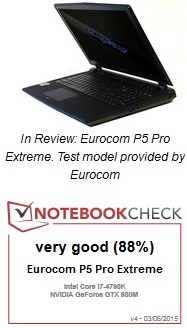 The Eurocom P5 Pro delivered the fastest performance we’ve ever recorded for a mobile workstation. 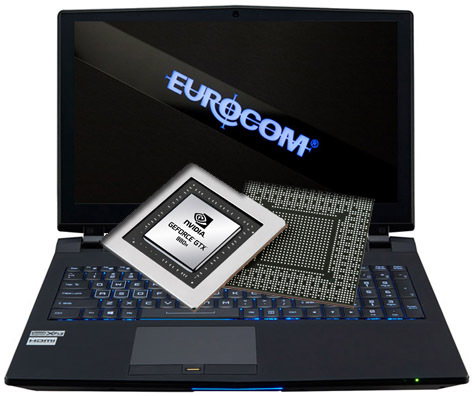 Eurocom says the P5 Pro is the world’s first Xeon-based 15.6-in. lightweight mobile server. It’s certainly fast. We think it makes a great mobile CAD workstation, but its price will likely relegate it to users who need the ultimate performance in a mobile form factor. 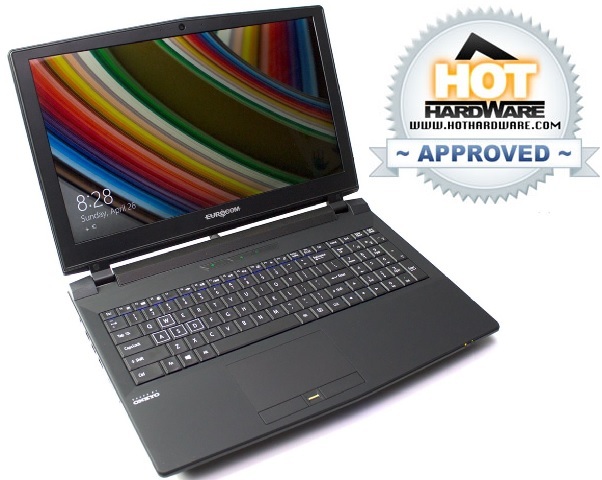 Thanks to its fast CPU, abundance of memory and high-end graphics card, the Eurocom P5 Pro turned in the best performance we have ever recorded for a mobile workstation. On the SPECviewperf test, which focuses solely on graphics performance, the P5 Pro beat all competitors — often by a wide margin — even surpassing the performance of some entry-level and midrange workstations. 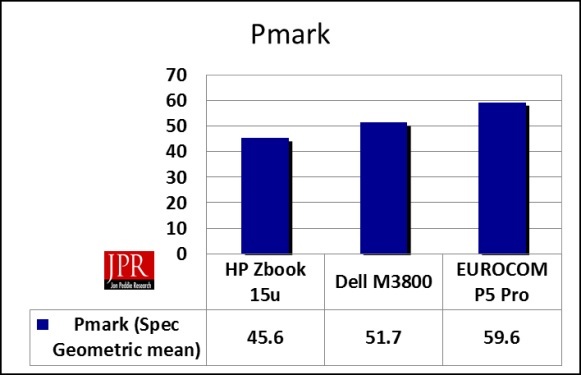 Similarly, on the SPECapc SolidWorks benchmark, which is more of a real-world test, the Eurocom P5 Pro beat out every other mobile system that we have tested to date and again surpassed many full-fledged workstations. Eurocom's P5 mobile workstation offers excellent power and expandability options. You would also expect this class of components to deliver serious performance. On that front, the P5 Pro holds its own in the mobile world, and in fact compares well with mid- to high-end tower systems. 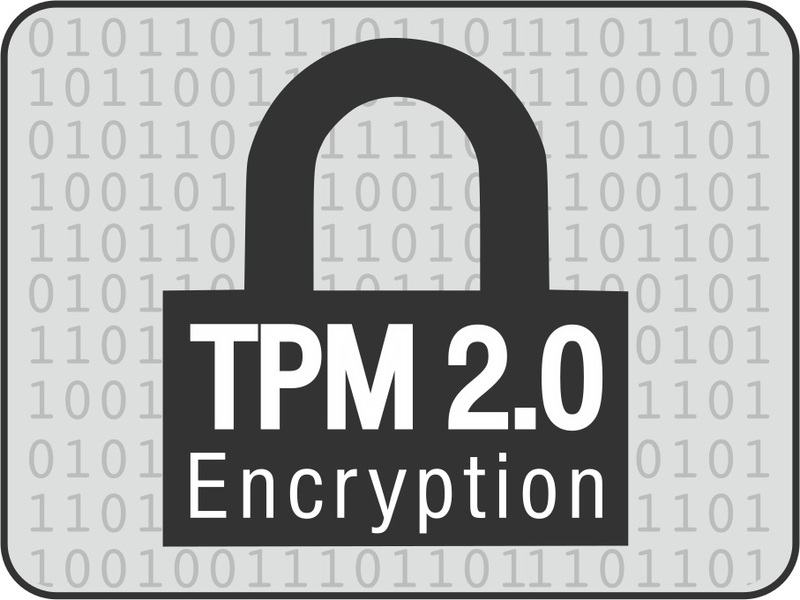 Although the model we received was close to fully loaded, there are a few options, such as even faster RAM, Xeon processors, and SSD RAID configurations that potentially could push performance a bit higher. The Eurocom P5 Pro is a big, tough-looking laptop, which is about what you’d expect from a desktop replacement. What I like about the Eurocom P5 Pro is the sense that it’s a complete package. It blasts its way through office and gaming benchmarks alike and it has rock solid audio to match the great picture on its sharp display. This system deserves a look if you're in the market for an ultra-powerful desktop replacement system. When it comes to evaluating the system’s performance in games, the benchmarks point to a very strong gaming system. Some of the P5 Pro’s features add to your experience without directly boosting benchmark scores. The 4K display is one such bonus and so is the P5 Pro’s support for upgrades. The sea of data storage in the P5 Pro is another feature that won’t move the needle in most gaming benchmarks. All of these make a difference in the value of the P5 Pro. Using the P750ZM from Eurocom (aka the Eurocom P5 Pro), we were able to easily increase clock speeds on the GPU by more than 10%, and a 20% boost only required the use of an unlocked VBIOS. If NVIDIA follows their usual pattern, the overclocked GTX 980M is likely going to be faster than the next halo mobile GPU from NVIDIA, whenever that shows up (probably in the fall). As with any overclocking attempt, the final stable limit will vary even with the same core hardware. We managed a 20% GPU overclock without too much difficulty on the Eurocom P5 Pro (P750ZM), but other P750ZM notebooks might do better or worse than our sample. The Gigabyte P35W v3 with the stock VBIOS also managed to max out the GPU overclock (around 12%), though the benefits aren’t as great thanks to the slower CPU and less robust cooling. Here at least Eurocom doesn’t disappoint, with a pretty well fully loaded solution being available. You can choose between several 1080p display options, as well as two different 4K panels (including the 4K Sharp IGZO display in our test sample). Four SO-DIMM slots allow for up to 32GB RAM, there are two M.2 slots (SATA or PCIe supported, though RAID requires SATA), another two 2.5” drive bays, and five USB 3.0 ports (with one being an eSATA combo port). Short of an SLI equipped notebook, this is pretty much the fastest system currently possible, and the only areas left to upgrade over the configuration we’re testing would be via increasing the amount of memory and/or solid state storage. 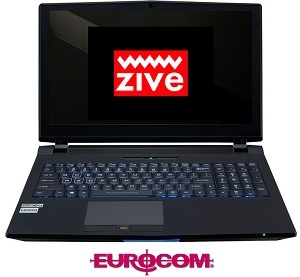 Otherwise, Eurocom sent us the maximum performance/quality configuration in every respect. We’ve got a Core i7-4790K that’s overclockable (more on that later), the GTX 980M, a 4K IGZO display, 16GB of DDR3-1866 RAM, 256GB of SSD storage, and even the optional 330W power adapter (again, more on that later). There are no surprises here: the P750ZM with a Core i7-4790K is basically the fastest notebook we’ve tested. A hex-core or octal-core LGA2011 chip could win out in multi-threaded scenarios, but that’s not really going to push gaming performance any higher, and even mobile workstations may not really need more than four cores. There are individual tests where the P750ZM doesn’t place first, but those are often influenced by other factors – e.g. faster quad-RAID SSD storage or access to Intel’s Quick Sync. When we get to CPU-centric testing, however, there’s no competition from the mobile parts; Cinebench and x264 encoding show a solid 20-25% improvement in performance over the next fastest processor. It’s interesting that even at 1080p Ultra quality (generally speaking, all settings at maximum) there’s still an average performance increase of ~5% gained by running the P750ZM with a desktop CPU. Of course, we’re looking at benchmarks with what is essentially the “entry level” mobile quad-core chip, the i7-4710HQ. That chip is nominally clocked at 3.2-3.5GHz where the i7-4790K is nominally clocked at 4.1-4.4GHz, so in tests like Cinebench the i7-4790K is around 25% faster than the i7-4710HQ. That 25% performance advantage can definitely show up in certain games, especially those that tend to only hit two CPU cores (e.g. StarCraft II, though we didn’t test that particular title). There will be games where the speedup is very large while others will show little to no difference. In general, at least at 1080p Ultra we expect the majority of newer games will see closer to a 0-10% performance change thanks to the CPU, all other aspects being kept constant. Drop the settings a bit and you’re more likely to start seeing 10-25% performance improvements, at least provided nothing else becomes a bottleneck. The Eurocom P5 Pro Extreme closes the gap by bringing home a full-fledged Core i7-4790K with overclocking and no compromises - This is a desktop in disguise. 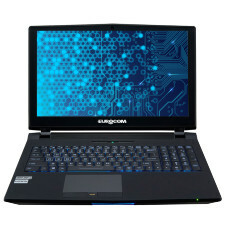 Compared to the earlier configuration, this Eurocom model is equipped with much more powerful internals including a 4 GHz i7-4790K CPU, GTX 980M GPU, and a high quality 4K (3840 x 2160) resolution IPS display. Eurocom is touting plenty of features with the 15.6-inch P5 Pro Extreme including the world's first laptop with a Z97 chipset and a socket LGA 1150, full overclocking support of Intel K series CPUs through specialized O/C BIOS, ability to change LCD panels, and pre-wired 3G/4G. As a gaming laptop, the Eurocom P5 Pro Extreme offers an unmatched level of customization and is one of the fastest 15.6-inch gaming notebooks around, especially if you're out looking for one with 4K options. We have to commend it for its powerful cooling solution here and Eurocom for offering an unlocked BIOS for overclocking. The overclocking potential is an excellent start and we can see it becoming better in future iterations, but at this point it just feels like a check box feature to stand out from the crowd. 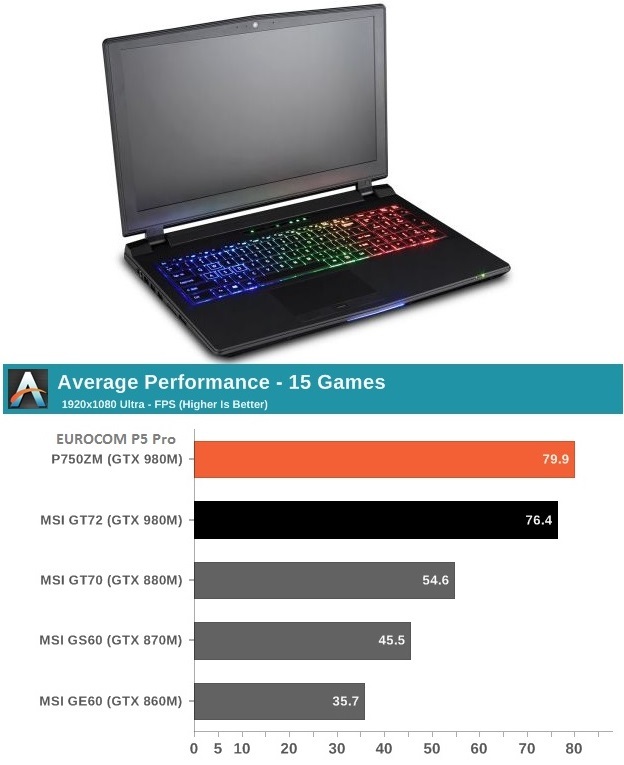 Until then, the high levels of connectivity, customization, and performance will continue to be the reasons for most buyers to choose Eurocom over more fixed gaming notebooks. The "Extreme" models in the P5 Pro series are equipped with Eurocom's specialized unlocked BIOS for overclocking and are so far the only laptops in the world with such support out-of-the-box. The CPU multiplier and voltages for RAM can be adjusted at boot up. What kind of performance gains can users expect? At 4.7 GHz, our CineBench R11.5 multi-core run finishes with 8.80 points vs. 9.40 points at the default 4.4 GHz (or 9.17 points at the default 4.4 GHz after a cold boot up).